One of my favourite things about living in Italy is the pizza, and it's recently given me an insight into how our brains are wired differently. Pizza has taught me that logic can be subjective and that subjective logic can be cultural. It has also made me humbly realise that, in some ways, I'll probably always be considered here as an ignorant foreigner. Traditional pizza comes from the southern city of Naples, but you can find good pizza everywhere, often, in fact, made by migrant Neapolitans. Under the porticoes here in Bologna, just downstairs from my flat, there's a great little takeaway pizzeria. Needless to say, I'm quite familiar with the place. I've been through a number of the menu's enticing combinations, a favourite being Grande Uccio, made with mozzarella, Tropea onions, parmesan and potatoes roasted in the pizza oven. The pizzaiola, Emanuela, is one of the few female pizza-makers I've ever come across, and her accent confirms she's from proper pizza territory. She's got crimson hair with blue streaks, which she covers with a bandana when she's working. I reckon in a past life she was probably a pirate. She's fierce but friendly... well, she was until last week. Because last week I made the mistake of asking her for a marinara - which is a simple tomato and garlic pizza - with the addition of mozzarella. As soon as I say the words, Emanuela looks at me with disbelief and, in retrospect I realise, disgust. "You can't have a marinara with mozzarella," she says. "It doesn't exist." "What do you mean, it doesn't exist?" I reply, oblivious to her hostility, since she's quite aggressive at the best of times. "I'd just like a marinara but with some mozzarella on top." Unwittingly I make matters worse by miming her mozzarella-sprinkling action. "La marinara is a pizza rossa," she states frostily. "A pizza rossa is made with tomato and without mozzarella. So you can't have a marinara with mozzarella because there's no such thing." Then she says something I find incredibly funny. "And the difference..." I ask, laughing blithely, "between a marinara with mozzarella and a margherita with garlic?" Emanuela doesn't laugh. She simply repeats her final offer. The Italian for sailor is marinaio, so this pizza may have originally been eaten by sailors. "According to some, the marinara pizza was invented at Pizzeria Port'Alba, the oldest pizzeria in the world, apparently to meet the demands of the sailors for a tasty pizza on days when there had not been a good catch, since they usually put anchovies and other little fish on pizza," says food writer Pina Sozio. "What makes the most sense to me is that it was the cheapest - just tomato sauce, garlic and oregano - and the sailors, some of Naples' poorest people, ate it for that reason," says food studies expert Zachary Nowak of the Umbra Institute in Perugia. "OK!" I concede, still amused but now slightly frustrated. "But I honestly can't see the difference between tomato and mozzarella plus garlic and tomato and garlic plus mozzarella! It's the same thing!" "No, it's not," pipes up a customer who until now has been quietly consuming his pizza and beer on a stool behind me. "She's right. A pizza rossa can't have mozzarella." Even the friend I'd come in with refuses to take my side. So I stop protesting - outwardly at least. A few minutes later, sliding our steaming pizzas into their boxes, Emanuela calls out: "One gorgonzola with chilli oil and one margherita with garlic." As we eat them upstairs in my flat, I'm still unable to come to terms with Emanuela's reaction. "I've ordered it a few times in various pizzerias, and nobody's ever batted an eyelid!" I say defensively. I'm now wondering if the waiters were simply being polite. Chicca - who's Sicilian - says she can see my point, but thinks it would be wise if in future I ordered margherita with garlic to avoid, I quote, "emotionally destabilising the pizza-maker". The next day I phone a friend who's both Neapolitan and a psychoanalyst to see what she thinks. "The pizzaiola is right," she says. "A marinara is not a marinara if you add mozzarella. But," she adds, "she was wrong to say she would make you a margherita with garlic because margherita with garlic doesn't exist." 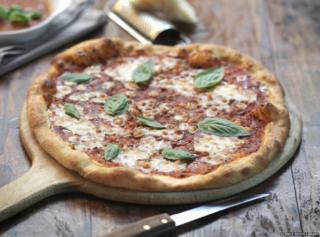 Legend has it that Queen Margherita of Savoy gave her name to the famous pizza on a visit to Naples in 1889. Sick of French gourmet cooking, she summoned the city's most famous pizza-maker, Raffaele Esposito, and asked him to bake her three pizzas - of which the tomato, mozzarella and basil recipe was her favourite. Is this true? Zachary Nowak examines the evidence for BBC Food: Was margherita pizza really named after Italy's queen? Later, I see Monica, an Italian sociologist who now lives in England. She confesses that she "sort of agrees" with Emanuela. "People who order marinara usually do so because they don't want mozzarella," she says. "So it does seem strange to then ask to add it." And that was when the penny finally dropped. At last, I understood that it was all about definition... of paramount importance in Italian culinary tradition. A marinara is, by definition, a pizza with tomato and garlic and no mozzarella. Essentially, I'd been asking for the equivalent of a black coffee with milk. So, should I ever want it again, I'll simply order a pizza topped with tomato, garlic and mozzarella. When it comes to Italian logic, this ignorant foreigner has finally learned her lesson. In my opinion, it was a matter of price. A marinara with mozzarella could cost less than a margherita. So probably she thought you tried to save money on a margherita, this way. And this made her crossly. When I was 17, I worked in a large chain fast food restaurant. On one occasion a customer insisted he wanted "a cheeseburger without the cheese". He got quite frustrated when I suggested he wanted a hamburger and insisted on getting what he asked for. I ended up just putting a hamburger in a cheeseburger wrapper and charging the extra 20p a cheeseburger cost at the time. When visiting Budapest and out for a quick lunch, I ordered fruit soup and my husband ordered the Gundell pancake. But he had noticed that there were house-made pickles on the menu so he asked for an order of those just to try them out. Our waiter, a true professional, was appalled. He said we simply could not have pickles with such an order nor would he compromise with any other selection than the goulash. As goulash was too large and heavy a dish for our lunch, we never did get the pickles. A dear, dear friend of mine upsets French waiters by asking for her meat to be 'very well done'. Through clenched teeth the waiters explain that the chef will refuse to cook all the taste out of the meat; they have standards to uphold. My friend ignores their obvious disdain and asks, 'But it will be cooked properly? Not a hint of pink?' They seethe and mumble unkind things about expecting nothing else from a nation that boils vegetables like their washing, while I try to salvage international relations by ordering my meat sanglant.